We are excited to announce our 2nd Annual Travel EXPO on Thursday, Oct. 6, from 5:30-8:30 p.m., at the High Country Conference Center. We have many tour operators and cruise lines and cover pretty much every corner of our planet! Come in, get some travel ideas and take advantage of exclusive show deals! Do you want to know about New Zealand? We just got back! We fell in love with this beautiful country and its diversity. While in the Bay of Islands, we visited a local fish auction and watched with fascination as our friend, Chris, skillfully filleted the fish and cooked an amazing seafood feast for us. At Taupo, we kayaked the river and soaked in hot springs. In Te Anau, we floated on an underwater lake beneath glow worms that lit up the cave ceilings like millions of stars. We hiked on the Abel Tasman Trek through lush forest along beautiful beaches. While cruising through stunning Milford Sound, we admired dolphins that were surfing in our wake! We sampled great wines at many charming wineries and loved all the fresh seafood and lamb dishes. This beautiful country with its friendly and fun people is definitely a favorite destination of mine and we can’t wait to get back! Stay in an Ice Hotel in Norway and be transferred from the airport by dog sled? What a perfect spot to see the Northern Lights. Hike through a tunnel carved by the Incas when hiking on the Inca Trail to Machu Picchu. This is a must-do destination for anyone who loves to hike and we have an excellent relationship with our contact in Peru to make sure you have the very best experience possible. 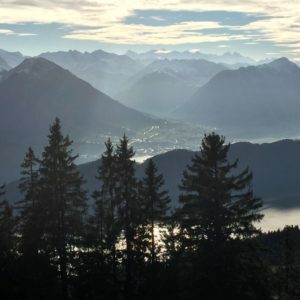 Ride on the steepest cog rail in Switzerland and listen to local Alphorn Players on the top of the mountain while eating a typical Swiss meal. Rappel down a waterfall and fly through treetops like Superman on a very unique zip line in Costa Rica. Or, how about celebrating New Year’s in Dubai? Checking out the famous fireworks? We still have space and can get you there! Monika Leuenberger is president and CEO of Avenues of the World Travel, located at 2915 N. Fourth Street, Flagstaff, Ariz. 86004. Contact her at monika@avenuesoftheworld.com or call 928-556-0853, or visit avenuesoftheoworld.com. How Do You Know It’s Time to Quit?